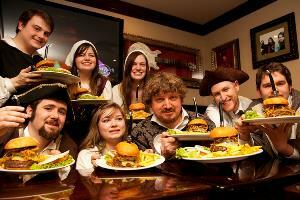 Mary King’s Close…to Bursting Burger Battle! 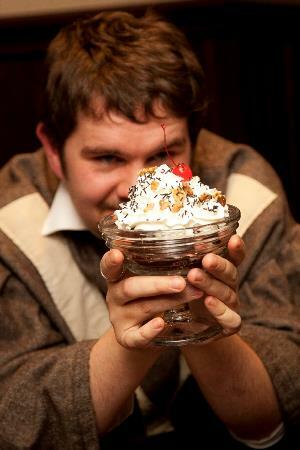 In under just eight minutes, The Real Mary King’s Close’s foul clenger polished off a whopping 10oz patty burger and all the trimmings created exclusively by Hard Rock Cafe for a burger challenge that raised £450 in aid of Action for Children. The sponsored challenge, which took place last week, marks The Real Mary King’s Close’s latest fundraising initiative for the children’s charity which so far this year has seen staff abseil down the Forth Rail Bridge and brave mud, fire, ice-water and 10,000 volts of electricity, bringing the total fundraising so far to £2,500. 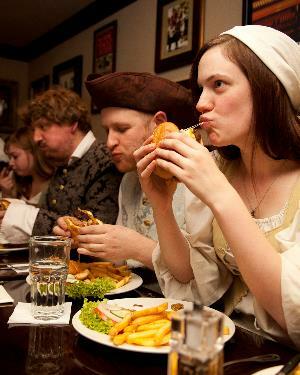 The foul clenger, a 17th century poet and the daughter of Mary King herself were amongst eight costumed tour guides battling it out to be the first to pack away the 10oz patty complete with fries and salad with all proceeds helping to support some of the UK’s most vulnerable and neglected children and young people. The patty named ‘Mary’s Close…To Bursting Burger’ was crafted after the chef took inspiration from his visit to Edinburgh’s top underground attraction and included black spices, 10oz of black pudding and heavy metal sauce to represent the darker side to Edinburgh’s history. Craig Miller, General Manager comments: ‘Each year we are committed to supporting a charity and this year, staff chose Action for Children. We are really thrilled to have Hard Rock Cafe, a world famous brand getting behind our fundraising efforts, helping us to further raise the profile of this worthwhile cause.